Welcome to Den Talk. I thought it would be a neat feature for the site to throw a few topics out there for discussion. A random, hopefully weekly column discussing the big issues surrounding the Lions at this time. So, let’s see what we can do for Issue 1 of Den Talk. The three days we attended training camp were filled with great weather and spirited competition. In fact, after reading that coach Mike Benevides had a new slogan; S.A.W. (Shut Up & Win), I was a little shocked at how much chirping going on. Of course it was the usual suspects, Lavar Glover, Korey Banks, Paris Jackson, Geroy Simon and a scattering of other participants joining in. After watching for a while, you realize it’s all part of the rigors of camp. Protecting your job, and your turf. Putting the new guys in their place, and showing them that a job on this team goes through you. Those that remain standing become the “team”. The Lions appear to have brought in some talent at the receiver position. All the new guys have some nice speed, and all of them have been catching the ball regularly. Terence Scott (Oregon) impressed me the most. He was getting a lot of looks by the club at various places on the field, and he was making the most of them. Otis Amey (Sacremento State) and Emmanuel Arceneaux (Alcorn State) also looked impressive. With Paris Jackson and Geroy Simon solid, and high hopes for returnee Ryan Grice-Mullen, the Lions could be building something special for QB Buck Pierce to work with. 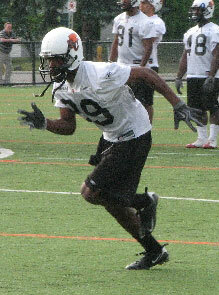 One of the really nice surprises at camp was watching the talents of 22 year old running back Andrew Harris. This kid has talent oozing out of his 5’11” 195 pound frame. He’s very fast, and can cut on a dime, and was very impressive. His young age and his postal code mean that the Lions can keep him around on the practice roster and develop him slowly, but this player could be a star in the league very soon. If you could throw Jamall Lee into the mix one day, the Lions could have a lethal all-Canadian backfield. It’s too bad Martin Bibla didn’t like being yelled at. On second thought, it’s a good thing. Bibla may be a good player, and a few reports had compared his style to the departed Rob Murphy, but when you’re complaining on the first day of camp there could be a “conflict” with your position coach, you’re pretty much revealing your character in my opinion. It’s a good thing the confict was resolved early. Heading into training camp, Dean Valli was considered by most to be the leading candidate for the left guard position left open after the Lions traded Kelly Bates. But after 5 days of camp it appears Jon Hameister-Ries is making a strong bid for the job, especially with Valli missing a session with a sore knee. I attended three days of training camp this week, and to my knowledge there was only one media member who shows up morning and afternoon. The Province’s Lowell Ullrich is THE football writer in Vancouver and there is a reason he breaks a lot of stories. He shows up every day, and does great work. There is no one I trust more when it comes to Lions information, and he’s the first place I look for Lions scoops. Thanks to Lowell for his great efforts, and make sure you bookmark his blog, The 5th Quarter.